An understanding of radionuclide distribution and radioactivity level in an ambient environment is important for assessing the radiation exposure to the population in a region. Two of the prominent sources of external radiation are the cosmic rays and terrestrial gamma rays. Natural radionuclides in soil generate a significant component of the background radiation exposure to the population. Investigations on terrestrial natural radiation have received worldwide attention and led to extensive surveys in many countries like Spain, Turkey, Nigeria, Malaysia, and Botswana. ,,,, The absorbed dose rate in air depends mainly on the radionuclide concentration in the soil, as the largest component of the gamma radiation comes from the terrestrial radionuclides and the cosmic rays. There is a direct correlation between terrestrial gamma and radionuclide concentrations in soil as it contains small quantities of radioactive elements like U and Th along with their progenies. Radioactivity in soil depends on its formation and transport processes that were inbuilt since soil formation. According to Gascoyne,  chemical and biochemical interactions influence the distribution patterns of uranium, thorium and their decay products. Therefore, the measurement of natural radioactivity in soil is important to determine the changes in the natural background radiation. Jaduguda is situated at the central part of the Singhbhum shear zone (SSZ), which is endowed with a number of copper and uranium deposits associated with nickel, molybdenum, bismuth, tellurium, and selenium. ,, Uranium mineralization is present in most parts of this belt, but at few places it is significant in terms of economic values. The Jaduguda uranium deposit is the oldest one in the entire belt and has been mined from last four decades. The natural background radiation of the study area has been investigated and reported by various authors. ,,, The aim of the present study is to determine the radionuclide activity concentration in soil samples collected from different villages around Jaduguda, and to evaluate the annual effective dose from the ambient radioactivity. The simplified geological map of the study area is provided in [Figure 1] redrawn from the geological map provided by Sarkar. The study area lies in Proterozoic metasediments of the SSZ in Jharkhand, eastern India. Significant geological formations which host the radioactive minerals are provided in [Figure 1]. The SSZ includes the Singhbhum Group (SG) of rocks in the north, the Dhanjori Group (DG) of rocks, and Singhbhum Granite (SBG) in the south. The SG consists of a monotonous rock sequence of pelitic schists, intercalated with micaceous quartzites, and mafic to ultramafic volacanics. , The DG consists of quartzite and metapelite in the lower part and mafic and ultramafic tuffs with low-Al, quartz normative tholeiitic lavas in the upper part. , SBG-III is granodiorite to granite composition. The area also included rocks, which are mylonitized due to shearing in the SSZ. The major rock types are found in the study area includes apatite-tourmaline-magnetite-biotite-chlorite-quartz schist (Granular rock), brecciated quartzite, autoclastic conglomerate, and biotite chlorite schist, which host the radioactive minerals. The present study covered seven villages namely, Ichera (22° 9' 38.3" N; 86° 21' 47.5" E), Tilaitand (22° 38' 56.9" N; 86° 20' 20.07" E), North Dungridih (22° 39' 22.3" N; 86° 20' 35.9" E), South Dungridih (22° 39' 11.0" N; 86° 20' 26.2" E), Chatikocha (22° 38' 57.1" N; 86° 20' 06.1" E), Bhatin (22° 40' 10.5" N; 86° 20' 11.4" E), and Kalikapur (22° 37' 05.5" N; 86° 17' 29.2" E) at a distance of about 1-10 km radius in the vicinity of the Jaduguda uranium mineralized zone. Surface soil samples were collected from 29 locations for gamma measurement. Bhatin and Ichera villages are overlying the SG formation comprising mica schists. North and South Dungridih villages are overlying the mylonitic rock formation, which is the signature of shearing. Chatikocha and Tilaitarn villages are overlying the DG of metasedimentary rocks and Kalikapur village is situated over the SBG. The soil samples were collected from 29 selected locations [Figure 1] along the seven villages. The sampling locations were chosen on the basis of the measured gamma dose rate (μR h -1 ) readings and taken from a height of about 1 m from the ground by a portable survey meter (type UR 705, www.nucleonix.com ) which provided different gamma levels from different rock types underlying the villages. It is presumed that the soils were derived from the respective rock types in the villages studied. Undisturbed soil samples were collected from the same location where the survey meter readings were taken, following the standard techniques given by the EML  Procedure Manual. A portable micro-R Survey Meter, type- UR 705 (manufactured by Nucleonix Systems Private Limited, Hyderabad, Andhra Pradesh, India, info@nucleonix.com) was used for in situ gamma level measurements. It is designed around an integrally coupled 2.54 cm × 2.54 cm scintillator coupled to a 2.54 cm × 1.27 cm photomultiplier tube. The detector assembly is within the survey meter enclosure. It has a sensitivity of 1 μR h -1 with accuracy better than ±15% with a 137 Cs source and a dead time of 16s which changes automatically depending on the rate level. The detection of gamma rays of cosmic sources is negligible due to the low response of the instrument to high-energy (1-5 MeV) gamma radiations. It detected a reading of only about half a division on the smallest scale of 1 μR h -1 (~8.7 nGy h -1 ). This detector is the most widely used device for all kinds of gamma ray surveys in India due to its efficiency. The soil samples were dried in an oven at 110° C overnight, to remove moisture, pulverized, homogenized, and sieved through a 2 mm mesh. About 350 g of samples was filled and sealed in leak-proof, air-tight PVC containers of 6.5 cm diameter and 7.5 cm height, weighed and stored for a period of 1 month for secular equilibrium between radium and thorium with their daughter nuclides. Each sample was then analyzed by HPGe gamma ray spectrometry. where A, B, and C are fitted coefficients. Using the above function, the efficiency for different energies can be calculated. Each sample was counted for 50 ks to reduce the counting uncertainity. Assuming that the daughter products of uranium and thorium will be in equilibrium, gamma lines from the daughter products of 226 Ra and 228 Ra are used for the present analysis. For uranium estimation, the following gamma energy peaks were used: 352 keV from 214 Pb, 609 keV and 1764 keV from 214 Bi. Similarly for thorium estimation, 911 keV from 228 Ac, 238 keV from 212 Pb, 583 keV from 208 Tl gamma peaks were used. The 40 K activity was estimated using the 1460 keV gamma peak. The activity concentration was estimated from the intensity of each line taking into account the mass of the sample, the branching ratio of the gamma decay, the time of counting and the efficiencies of the detector. 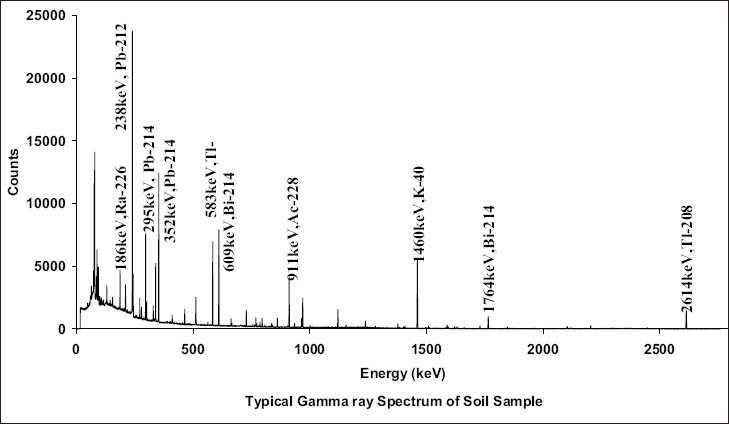 A gamma ray spectrum recorded with a HPGe detector is shown in [Figure 2], with the gamma lines from various daughter nuclides of 232 Th, 238 U, and 40 K from the soil samples. The radionuclide concentration for the collected surface soil samples indicates the variability of geological formation for the area studied. [Table 1] summarizes the specific activity of 238 U, 232 Th, and 40 K in the soils in Bq kg. The 238 U activity is distinctly higher than the 232 Th and it ranges from 20.1 to 120.0 Bq kg -1 with a mean activity of 53.8 ± 3 Bq kg -1 . The 232 Th concentration ranges from 23.8 to 69.9 Bq Kg -1 with a mean activity of 45.0 ± 2.1 Bq kg -1 . 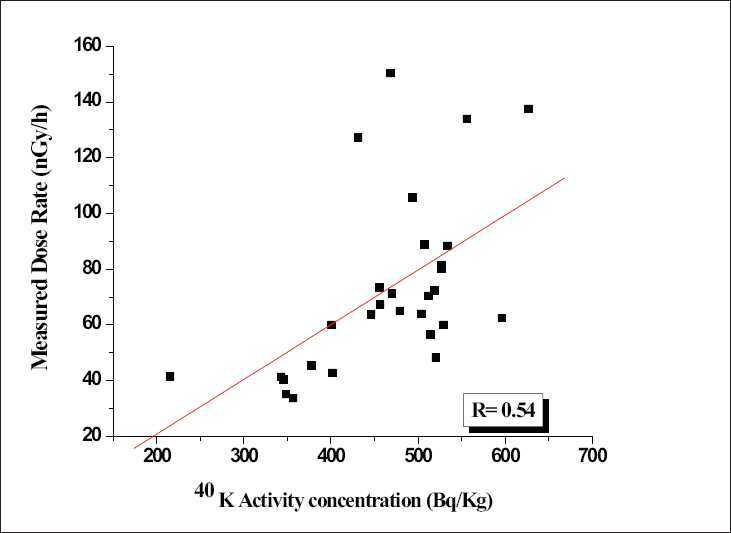 The 40 K concentration ranges from 396.5 to 513.8 Bq kg -1 with a mean activity of 462.2 Bq kg -1 . The study area comes under the shear zone and contains a relatively higher concentration of uranium and less thorium, which reflects in the soil radioactivity concentration. Soils are considered as the weathered products of rock types and the distribution of radioactive elements is immensely affected by processes like weathering and erosion. Soil radioactivity mainly depends on the types of rock from which the soil originates. The highest concentration of 238 U was found in North Dungridih and South Dungridih villages, whereas the 232 Th and 40 K concentration was found similar in all the villages. The difference in the specific radionuclide concentration in the villages may be related to the underlying bed rock types and local geology of the study area. 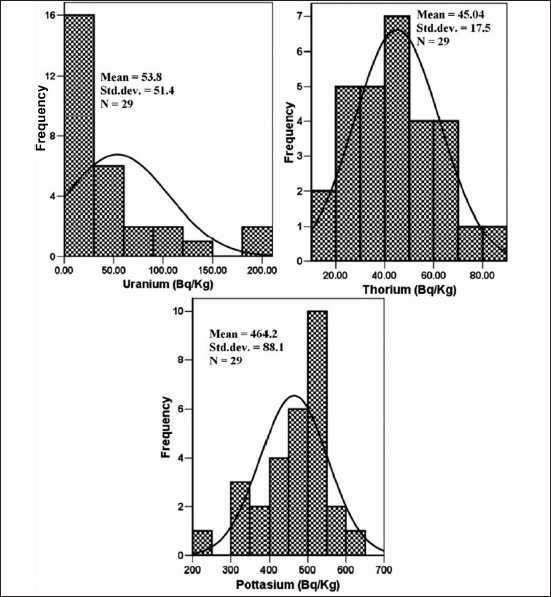 A frequency distribution was attempted to show the distribution of radionuclides in the study area and is provided in [Figure 3]. The 238 U activity fitted to the log normal distribution with an asymmetrical curve indicating its dominance in a particular region, whereas 232 Th and 40 K fitted to a normal distribution with symmetrical curves indicating an even distribution throughout the study area. The global average of 238 U, 232 Th, and 40 K in soil is 35, 45, and 420 Bq kg -1 , respectively. In the Indian context, these values are 31, 63, and 394 Bq kg -1 , respectively. The results obtained from the present study were compared to the world as well as Indian average values shown in [Table 2]. The absorbed dose rate (D, nGy h -1 ), a relevant quantity when considering radiation risk to humans, at a height of 1 m above the ground surface due to the concentrations of 238 U, 232 Th, and 40 K in the soil is estimated using Eq. (2) for all the sampling locations and presented in [Table 3]. The absorbed dose rate estimated from soil for Indian sub-continent is about 69 nGy h -1 and the world average is 51 nGy h -1 . In the present survey the average outdoor gamma dose for soil ranged from 41.8 to 119.6 nGy h -1 with a mean value of 72.5 nGy h -1 which agrees well with the global average values. The annual effective dose in the environment to the population was estimated using Eq. (3). The conversion coefficient of 0.7 Sv Gy -1 and an occupancy factor of 0.2 are provided according to UNSCEAR reports. The conversion coefficient gives the equivalent human dose in (Sv y -1 ) from the absorbed dose rate in air (nGy h -1 ), while the occupancy factor gives the function of the time an individual is exposed to outdoor radiation. Considering that people in India on an average spend ~20% of their time outdoors, the annual effective dose rates were calculated. In the present study, the effective dose rate ranged between 0.05 and 0.15 mSv y -1 with a mean value of 0.09 mSv y -1 , which is similar to 0.07 mSv y -1 given in UNSCEAR as the worldwide representative value. In order to find the existence of these radioactive nuclides together at a particular place, correlation studies were performed between combinations of radionuclides like 238 U and 232 Th and 238 U and 40 K. A very poor correlation observed between individual activity concentrations of radionuclides, which indicate individual results for any one of the radionuclide, is not a good predictor of the concentration of the other. Therefore, an attempt was made to delineate the contribution of individual radionuclides toward the measured gamma dose rate in the study area irrespective of the cosmic radiation. Correlation studies were performed between the measured dose rates with the respective radionuclide activity concentration. The correlation has been given in [Figure 4], [Figure 5] and [Figure 6]. 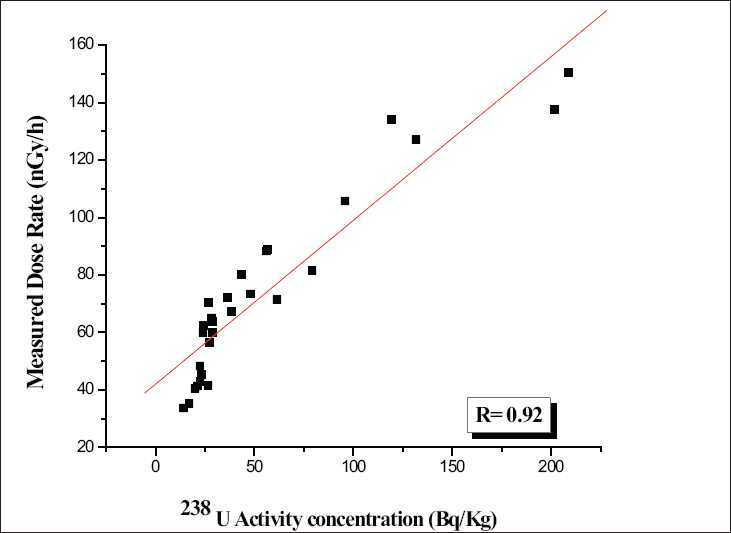 There is a good correlation between the 238 U activity (0.92) and the measured dose rate as shown in [Figure 4]. A poor correlation existed between 232 Th (0.77) and 40 K (0.54) with the measured dose rate as shown in [Figure 5] and [Figure 6]. Since the study area is one of the major uranium deposits found in India, major portion of the dose may be contributed due to the 238 U series as well as by 232 Th series and a negligible activity due to 40 K. The present 238 U, 232 Th, and 40 K activities in the surface soils are due to both natural and anthropogenic activities in the study area. The Hex value must be less than 1 to keep the radiation hazard insignificant to the people. The calculated Hex value for the soil samples studied ranged between 0.23 and 0.70 with an average value of 0.41 [Table 2]. These values are far below the criterion limit as per European Commission of Radiation Protection reports. The surface soil from the villages has no high exposure for either inhabitants and can be used as a construction material without posing any significant remediation. The terrestrial gamma dose rates at each sampling village are plotted using SURFER (software version 8). [Figure 7] shows the 3D plot of the computer-generated gamma Isodose map of the region studied. The enhanced activity areas are indicated with higher peak regions in the plotted map. 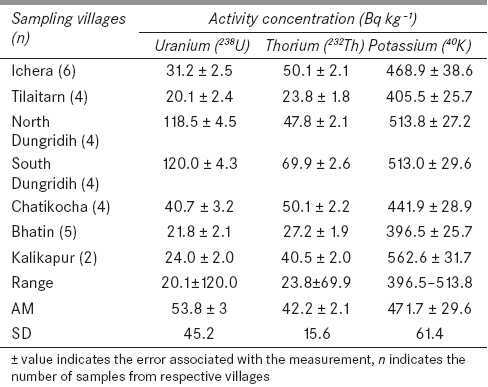 The results obtained from the present work provide additional data on the radioactivity levels in the surface soil from the villages around Jaduguda. The measured activity concentrations of radionuclides and gamma dose rates are compared with the global and Indian average values. 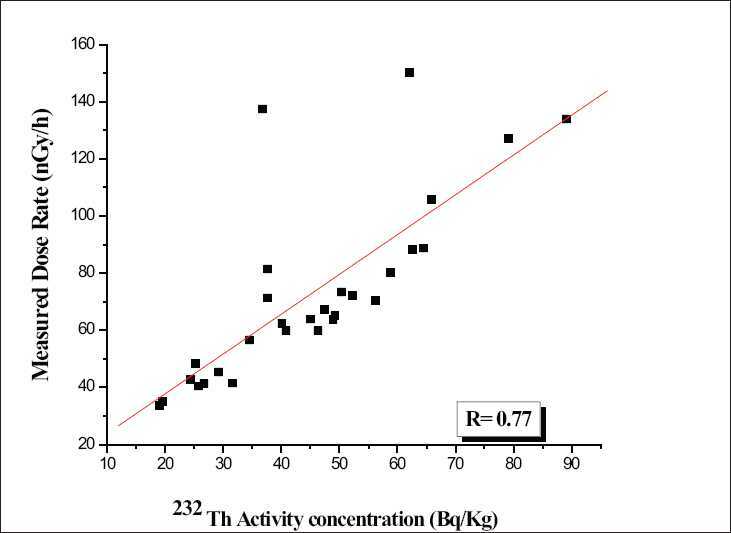 Gamma spectrometric analysis of the soil samples indicates that the activities due to major radionuclides in the uranium series are significantly high as compared to thorium and potassium. This is due to the widespread uranium mineralization in the study area. There is a good correlation between 238 U series with the gamma dose rate. However, it is observed that in two villages, i.e., North and South Dungridih, the activity concentration of 238 U is higher as compared to the other villages studied. The value of the external hazard index determined in the soil is less than the recommended levels. 1. Murty VR, Karunakara N. Natural radioactivity in the soil samples of Botswana. Radiat Meas 2008;43:1541-5. 2. Moreno V, Baixeras C, Font LI, Bach J. Indoor radon levels and their dynamics in relation with the geological characteristics of La Garrotxa, Spain. Radiat Meas 2008;43:1532-40. 3. Baykara O, Doπru M. Determination of terrestrial gamma, 238 U, 232 Th, 40 K in soil along fracture zones. Radiat Meas 2009;44:116-21. 4. Alatise OO, Babalola IA, Olowofela JA. Distribution of some natural gamma-emitting radionuclides in the soils of the coastal areas of Nigeria. J Environ Radioact 2008;99:1746-49. 5. Lee SK, Wagiran H, Ramli AT, Apriantoro NH, Wood KA. Radiological monitoring: Terrestrial natural radionuclides in Kinta District, Perak, Malaysia. J Environ Radioact 2009;100:368-74. 6. Degerlier M, Karahan G, Ozger G. Radioactivity concentrations and dose assesment for soil samples around Adana, Turkey. J Environ Radioact 2008;99:1018-25. 7. 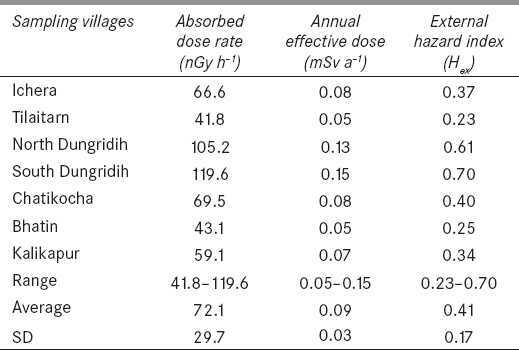 Rabesiranana N, Rasolonirina M, Terina F, Solonjara AF, Andriambololona R. Top soil radioactivity assessment in a high natural radiation background area: The case of Vinaninkarena, Antsirabe-Madagascar. Appl Radiat Isot 2008;66:1619-22. 8. Gascoyne M. Geochemistry of the actinides and their daughters. In: Ivanovich M, Hermon RS, editors. Uranium series disequilibrium: Application to Earth, Marine and Environmental Sciences. 2 nd ed. Oxford: Clarendon Press; 1992. 9. Dunn JA, Dey AK. The geology and petrology of Eastern Singhbhum and surrounding areas. Mem . Geol. Surv. India. 1942;69:281-456. 10. Deb M. Aspects of ore mineralization in the central section of the Singhbhum copper belt, Bihar. Ph.D. Thesis. Calcutta: Jadavpur University; 1971. 11. Narshiman D, Rao NK. Occurance of native gold, silver, tellurium and bismuth in copper ores of Singhbhum shear zone, Bihar and its significance. Abst. Papers, 4 th Ind. Geol. Cong. 1982;12-13. 12. Sarkar SC. Uranium (-nickel-cobalt-molybdenum) mineralization along the Singhbhum copper belt, India and problem of ore genesis. Mineralium Deposita 1982;7:257-78. 13. Sahoo SK, Mohapatra S, Sethy NK, Patra AC, Shukla K, Kumar V, et al. Natural radioactivity in roadside soil along Jamshedpur-Musabani road: A mineralized and mining region, Jharkhand and associated risk. Radiat. Prot. Dosim; doi: 10.1093/rpd/ncq111. 14. Jha S, Khan AH, Mishra UC. A study of the technologically modified sources of 222 Rn and its environmental impact in an Indian U mineralised belt. J Environ Radioact 2001;53:183-97. 15. Khan AH, Basu SK, Jha VN, Jha S, Kumar R. Assessment of Environmental Impact of Mining and Processing of Uranium Ore at Jaduguda, IAEA International Symposium on the Uranium Production Cycle and the Environment, Vienna, 2000. 16. Chakrabarty A, Tripathy RM, Puranik VD. Occurances of NORMS and 137 Cs in soils of Singhbhum region of Eastern India and associated radiation hazard. Radioprotection 2009;44:55-8. 17. Sarkar SC. 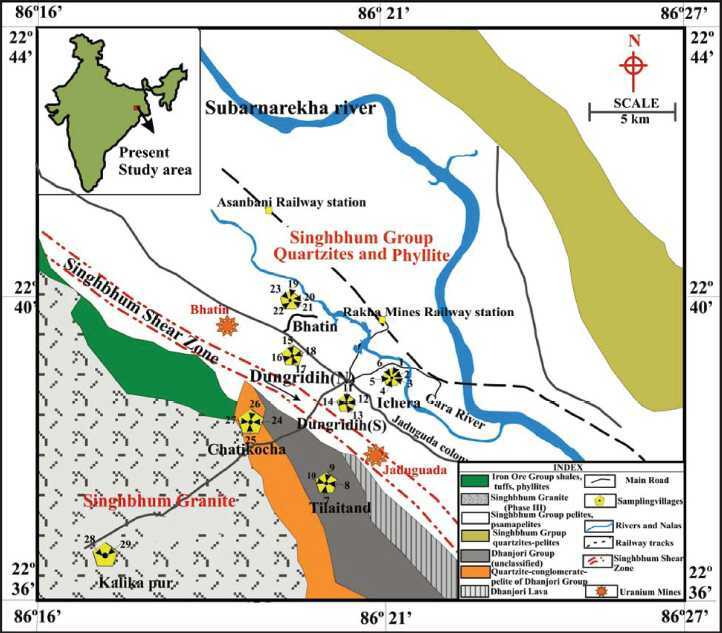 Geology and ore mineralisation of the Singhbhum copper-uranium belt, Eastern India. Jadavpur University, I.N.A. Press, Calcutta; 1984. 18. Rao NK, Rao GV. Uranium mineralization of Singhbhum shear zone, Bihar. IV. Origin and geological time frame. J Geol Soc India 1983;24:615-27. 19. Saha AK. Crustal evolution of Singhbhum North Orissa, Eastern India. Geological Society of India. Memoir 27, Bangalore; 1994 . 20. Bhattacharya DS. Early proterozoic metallogeny, tectonics and geochronology of the Singhbhum Cu-U Belt, eastern India, Pre-Cambrian. Research 1992;5r:71-8. 21. Sarkar SC. Crustal evolution and metallogeny in the eastern Indian craton. Geol. Surv. India. Spl. Pub 2000 ;55:169-94. 22. 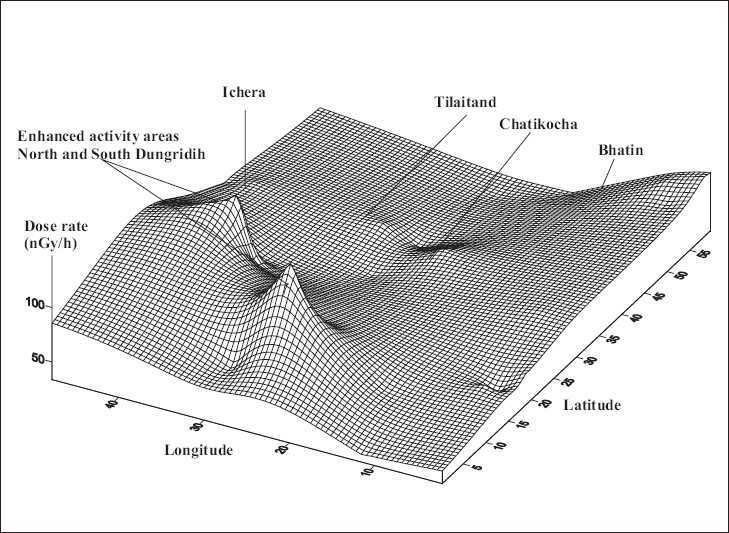 Misra S. Precambrian chronostratigraphic growth of Singhbhum-Orissa craton, Eastern Indian shield: An alternative model. J Geol Soc India 2006;67:356-78. 23. EML Procedure Manual. Environmental Measurement Laboratory (HL Volchok and G de Planque. Eds.) Vol. 26 New York: US Department of Energy; 1983. 24. Mohanty AK, Sengupta D, Das SK, Saha SK, Van KV. Natural radioactivity and radiation exposure in the high background area at Chhatrapur beach placer deposit of Orissa, India. J Environ Radioact 2004;75:15-33. 25. Narayani K, Anilkumar S, Rekha AK, Kerur BR, Nagabhushan NM, Lagare MT, et al. Natural radioactivity analysis of granite and stone samples from North Karnataka, Proceedings of the Fifteenth National Symposium on Environment (NSE-15), 2007. p. 372-6. 26. UNSCEAR: Sources and Effects of Ionizing Radiation, United Nations Scientific Committee on the Effects of Atomic Radiation Report to the General Assembly with scientific annexes, v. I, 2000. 27. War SA, Nongkynrih P, Khathing DT, Iongwai PS, Jha SK. Spatial distribution of natural radioactivity levels in topsoil around the high-uranium mineralization zone of Kylleng-Pyndensohiong (Mawthabah) areas, West Khasi Hills District, Meghalaya, India. J Environ Radioact 2008;99:1665-70. 28. Kamath PR, Menon MR, Shukla VK, Sadasivan S, Nambi KS. Natural and fallout radioactivity measurement in Indian soil samples by gamma spectrometric technique. 5 th National Symposium on Envt. VECC, Kolkata, India. 1996. p. 56-60. 29. Yang TF, Walia V, Chyi LL, Fu CC, Chen CH, Liu TK, et al. Variations of soil radon and thoron concentrations in a fault zone and prospective earthquakes in SW Taiwan. Radiat Meas 2005;40:496-02. 30. Yu KN, Guan ZJ, Young EC. The assessment of natural radiation dose committed to the Hong Kong people. J Environ Radioact 1992;17:31-48. 31. European commission on Radiation Protection. Radiological Protection Principle Concerning the Natural Radioactivity of Building Materials. European Commission, Brussels Report No. 112, 1999. 32. Karunakara N, Somasekarappa HM, Siddappa K. Natural radioactivity in South West Coast of India. Int Congr Ser 2005;1276:346-7.